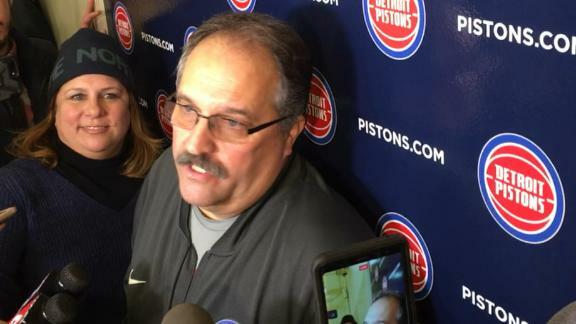 AUBURN HILLS, Mich. — Stan Van Gundy knows there is risk in dealing for Blake Griffin, but it’s a risk the Detroit Pistons?coach and president of basketball operations was willing to take for a franchise in need of a boost. “Our thinking was this: The hardest thing to do in this league is to get a proven star,” Van Gundy said after Tuesday’s shootaround. “It’s just very hard to do. It’s hard to do in free agency. It’s hard to do in trades. You get very few opportunities to do it. Detroit acquired Griffin on Monday night in a package that sent Tobias Harris, Avery Bradley, a future first-round pick and some other assets to the Los Angeles Clippers. Griffin is averaging?22.6 points and 7.9 rebounds per game this season, on par with his career averages of?21.6 points and 9.3 boards per game. He has dealt with knee, quadriceps, elbow, hand and back injuries during his career and has only played an 82-game season once, in 2010-11. Van Gundy said Griffin would not be available to play in Tuesday night’s game against the Cleveland Cavaliers. He noted that Griffin, who still hasn’t arrived in Detroit, is “questionable” for Thursday’s game against the Memphis Grizzlies, as all players involved in the deal have to pass their respective physicals. The Pistons (22-26) enter Tuesday’s game having lost eight games in a row, but Van Gundy held firm to his conviction that the circumstances didn’t necessarily prompt the trade. “If we had won 10 in a row and Blake Griffin were available, we would have done the same thing,” Van Gundy said. Van Gundy said he spoke to Griffin after the deal was completed and that he was “eager for the challenge” to help the Pistons. “If there were no risk involved, if Blake didn’t have any injury history, he wouldn’t be available,” Van Gundy said. “So we take the risk to get that high-level talent. We just weren’t in a position, we’re not in a position even now, even with eight losses in a row, and we haven’t been in a position even before I got here to get draft pick 1, 2, 3 [or] 4. Griffin’s new teammates are excited to get the chance to play with the No. 1 pick from the 2009 draft. Van Gundy acknowledged that three weeks ago he never would have thought he’d be dealing Harris in this kind of move, but he reiterated that anything can happen in the league, especially this time of year. Van Gundy admitted that part of the reason Bradley was included in the deal was because the Pistons figured he would probably field higher offers as he hits the market this summer. Van Gundy compared his wheelings and dealings to that of a baseball team. “When you look at all the analytics … we understand that it’s a perimeter league,” Van Gundy said. “But if you look at like the Tampa Bay Rays in baseball — so everybody wanted power hitting and on-base percentage. They couldn’t get that. What did they go do? They went and built it on relief pitching and defense and were very, very competitive for years. The Pistons seem most excited about the idea of pairing Andre Drummond?–?the NBA’s leading rebounder this season — with Griffin and seeing how the duo can take over games. But Van Gundy knows his team will undergo some major schematic changes in the short term. As the dust cleared on one of the biggest trades of the year, Van Gundy reiterated that no player in the NBA is above being traded if the right package presented itself.